« Does It Still Make Sense To Give To Charity? I think I speak for most people when I say that at some point in our life we put something on our credit card and didn’t pay it off in full, leading to a vicious circle of recurring payments and mounting interest on the balance! Most of us get “stung” once and learn the lesson of how to use a credit card sensibly, but unfortunately some of us don’t learn and we begin to develop an unhealthy relationship with our credit card. You might have had a very valid reason for getting into credit card debt. But being in debt two years later is simply poor money management. Credit cards are designed to help us when we are in a pinch or to cover an unexpected expense, but they should never be used to satisfy our constant thirst for instant gratification. The first step to getting control of your credit card debt is to remove yourself from the fantasy mindset that your debt is under control as long as you can afford to make the minimum monthly payment. Debt will linger and multiply, and with the annual rates of 19.75 % p.a. compounding monthly, you cannot just wish it away! If you have multiple credit cards, focus on each interest rate rather than on the account balance. The amount you owe doesn’t really matter when there is an enormous amount of interest that you are paying. Try to attack and pay off the card with the highest interest rate first; once that is done, close the card down. Remember: you don’t need multiple credit cards – one card is just fine. 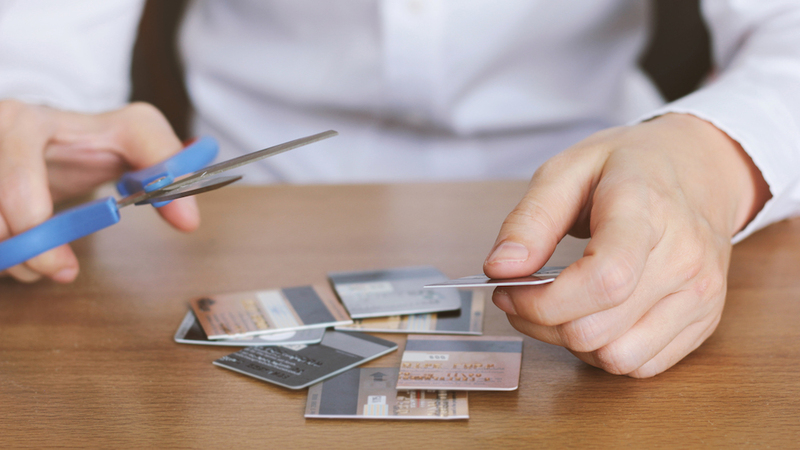 When that card is paid off, move on to the next debt with the next highest interest rate. Break the bad habit of only paying the minimum payment each month – only repaying this figure [usually 2 or 3 per cent of the outstanding balance] just prolongs the agony. And it’s precisely what the credit card companies want you to do! The reality is, the longer you take to repay the balance, the more interest the credit card companies make, and the less cash you will have in your wallet. Once you start paying back more than the minimum, your debts will actually start to reduce instead of gradually increasing, which happens when you only pay the minimum amount. Paying just the $60 minimum payment on a $3,000 credit card balance would take eight years to pay off and cost you approximately $2,780 in interest. If you pay an additional $50 per month, your debt would be paid off in just three years and you would have saved $1,800 in interest charges. By making a few sacrifices, you will have the extra dollars you need to increase your debt repayment schedule dramatically. Those increased payment amounts will help save thousands of dollars in interest in the long term, but you need to stick with the plan month in, month out. Prioritise your new monthly debt repayment amount along with your other essential bills. Think of it as your “first of the month” bill as opposed to just chipping away at it when you have some spare cash. I would normally never recommend someone cashing in their savings to pay off debt, but in some circumstances it can be the best course of action. If you have a savings account with a $4,000 balance paying 0.50% pa in interest and you have a credit card balance of $3,000 with a 19.75% pa interest rate, it should be a “no brainer” – pay off the debt. Yes, it might wipe out your savings, but you will have stopped the “bleeding” and the next month you can really look at your finances to figure out ways to reduce expenses and increase savings. The end result should be a balanced budget with no debt. Once you have started to create a plan to pay off the credit card[s] sooner rather than later, you mustn’t forget saving for emergencies. I would recommend looking at your company pension plan as a vehicle to do that: it comes with the benefit of payroll deductions and goes into your pension plan as opposed to your bank account. The funds will always be voluntary, meaning if something does arise as an emergency, you can simply withdraw those extra voluntary funds to cover it. If nothing arises, then you have saved additional funds for retirement *make sure to check with your company pension plan rules first*. If after paying all your bills at the end of the month there is nothing left over, regardless of how diligent you have become with your budget, then you have only two ways to fix it: further reduce your spending or increase your income. At the end of the day, managing money takes discipline, sacrifice and commitment, and brings to mind the old English proverb “Take care of the pennies, and the pounds will take care of themselves”. Carla Seely is the Vice President of Pensions and Investments at Freisenbruch-Meyer. If you would like any further details, please contact her at cseely@fmgroup.bm or call +1 441 297 8686. This entry was posted on Tuesday, August 21st, 2018 at 10:29 pm	and is filed under Uncategorized. You can follow any responses to this entry through the RSS 2.0 feed. Both comments and pings are currently closed.